We were really looking forward to our ten-day stop in Tenerife. Ten days to wind down and relax in the Canaries. After a great reach across from Gran Canaria we got our berths and settled down in Santa Cruz Marina, which is really well situated in the centre of town. That afternoon we relaxed on board and started the winding down process. The next day was spent relaxing and wandering around the city of Santa Cruz by foot. Santa Cruz is a lovely laid back city, backed by picturesque mountains. It’s a city of one or so million, the capital of the island of Tenerife, which has 2 or so million people. I like cities like Santa Cruz, big enough to be able to get everything but small enough to get across town by car in 10 minutes (20 minutes by bike). 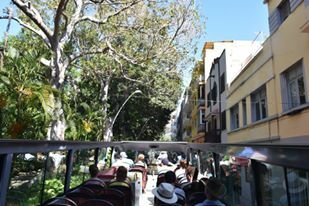 We got a good taste of Santa Cruz on Tuesday as the Rally gave us free City Tour tickets on one of those hop on, hop off, red open top double-decker buses. We travelled up and down its beautiful wide boulevards, past interesting parks and typical Spanish outdoor sculptures and a very interesting entertainment centre that bore some similarities to the iconic Sydney Opera House. Then it was time to hop on our bikes and head out to the beach. Las Teresitas is an amazing looking beach, quite long and made up of imported Saharan sand. It took us about 30 minutes to ride there against a strong breeze which made the beach a sand blasting zone – even the beach bars were suffering. . Still the water was nice and I had a refreshing swim. We had to rush back to meet Anya who was crewing for us down to Cape Verdes. We first ran across Anya in Croatia and we promised to cross paths again when we made it to Tenerife as that is where she lives. Dee and her hit it off, alternating between Spanish and English even though Anya’s English is pretty good. That night we all went off on another rally freebee to the Theatre to listen to a young Canarian orchestra play the music of some American Movies. I’ve never heard so much clapping in my life. It was okay but nothing to really write home about. The Rally had a pretty good programme of activities going on. On Thursday, we headed off to see El Tiede, the not so extinct volcano that towers above the clouds, 3718m above sea level, making it the highest mountain in Spain. Measured from its base on the ocean floor it is 7500m, making it the 3rd largest volcano in the world after a couple in Hawaii. We didn’t take the cable car right to the top but instead walked around the surrounding lunar like landscape, which made for some great photos. Back from the tour, we took a break before hopping on the Tram with Kim, Simoon and Chrispy to La Languna, 1000m up behind Santa Cruz. La Laguna is a beautiful old town, having been declared a World Heritage Site in 1999. Theres some great walking streets with lots of old villas and houses. La Laguna has often been called the “Florence of the Canary Islands”, because of its large number of churches and convents, as well as its old town and historic buildings. After confirming this title by walking around, we suddenly got hungry and headed off to find some food. We first tried out one of those restaurants with hams hanging from every available ceiling space, before Anya messaged and said to check out Doctor Olivera (La Laguna is where Anya lives and studies). So off we went and had some great Tapas and great Tempranillo. Next day was a boat job day before we headed up to the yacht club for our Welcome Party. It started off pretty formally with each yacht receiving a plaque before we got fed and watered with a great spread. As Jimmy said, it’s very rare to see food left over at a yachties function but that is what happened….there was just so much good food. Then it was back to La Mischief for drinks and dancing. I remember thinking about 12.30am that I needed to go to bed as we were getting up at 5am to watch the AFL Grand Final. Phil and Chrispy skipped the going to bed part completely and managed to create some havoc around town in the wee small hours. Simon and I joined them at the anointed hour and headed off to the local library of all places. Chrispy had sussed it out earlier and we sat outside, signed up for WatchAFL and settled in to watch a great game. It was okay for a while until the library started to stir with people around 7am. Phil was being “Particularly Loud Phil” so security arrived and told us to stop drinking and to be quiet. After all it is a library! Phil was having trouble locating his volume button despite Simon and I continuing to suggest he hit the mute button. Anyway somehow we managed to nearly see the end of the game before we hd to move around the corner to watch the end of an epic match. Go the Doggies. Back at the boat, we met a well rested Dee and headed off with Anya in her car to see her take on her island. It turned out to be a brilliant day, visiting beautiful see side towns, great beaches with great beach bars, old towns up in the hills and Playa de Americas, which is a famous seaside resort on steroids, albeit a little too full of package holiday tourists for my liking. We ended the day in Peurto Cruz, which was a gem of a place. Lovely seaside town, with a water park out the front, nice little walking streets full of hundreds of restaurants, with plenty of music and colour. We ate some beautiful tapas at a great outdoor restaurant and wandered the streets afterwards. Anya needed to get home for dinner at 10ish so we drove the half an hour back to Santa Cruz and said our thankyou’s. I slept very well that night! Sunday saw us rent our own car and head to the North of the Island. 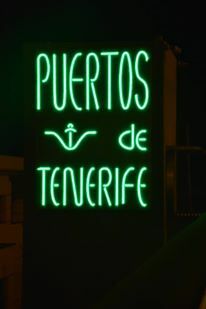 Several people, including Anya, had recommended this part of Tenerife to us and it turned out to be a good recommendation. We drove up some winding roads into the mountains and down the other side to some beautiful beaches. We stopped at Benijo to eat Tapas on a cliff top overlooking one of these beaches before heading back into the mountains to drive through dense rain forest – quite a spectacular drive. We ended up on the NW coast and had a swim in one of the pools next to the natural rock pools, before finally ending up once more in Peurto Cruz for a great wander around and some nice seafood. Monday was shopping. Tenerife was the last decent shopping before Barbados in 2 months time, so we attempted to clean out both Carrefour’s and Lidl’s. We did a pretty good job of buying for 5 people across the Atlantic as well as our time to Cape Verdes and in Cape Verdes. We did an even better job of storing it all on the boat. We also went printer ink shopping as the Ink Cartridge we bought in Gran Canaria didn’t work in the printer we bought in Turkey. And now we know there is nothing we can do about it unless we get one from Turkey. So reluctantly we bought a new printer. Nothing else we could do. That night we had some drinks in Maisee, one of the yachts who started the rally by sailing under the Tower Bridge in London – cool. Then it was off to bed for an early start to La Gomera at 6am in the morning. This entry was posted in Canary Islands and tagged la laguna, puerto cruz, santa cruz, tenerife by stull61. Bookmark the permalink.